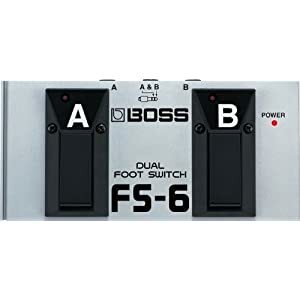 If you are lucky enough to have a higher-end amp or pedal by Roland or Boss, you know that many of their products have footswitch options. A footswitch enables you to turn a certain effect on or off on an amp, allow you to scroll through memory banks on a multi-effects pedal, or do any number of things that would otherwise be controlled by turning knobs. The obvious purchase to cover this need would have been a Boss FS-6 or similar footswitch pedal. However, the Boss switches only run on batteries and I’d rather plug straight into the wall (it saves batteries and hassle). 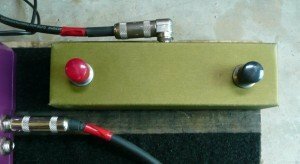 That prompted some more research and I found out that you can make your own FS-6 style replacement footswitch very easily and cheaply (and it doesn’t even NEED batteries!). Of course, the official Boss pedal does more things and is a more high-end product than what I ended up with. That said, I saved around $45 just with a trip to Radio Shack and a bit of easy soldering. 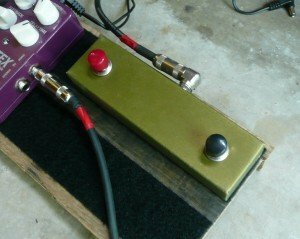 What I made is a momentary foot switch. It can be used for tap tempo, bank switching, and turning effects on and off (provided the unit remembers when you hit the effect on and off). It doesn’t “click” on and send a steady signal – only just as long as you press the switch for. If you need a switch that turns on or off indefinitely, use “latching” switches instead. A stereo 1/4″ jack allows the use of a TRS stereo cable to send two signals back an forth. That means you can send info from two switches through one cable. Before I did my research I thought the Boss switch was a high tech piece of machinery that sent complicated messages back and forth to the pedal or amp. Nope, it’s much simpler than that. If you plug a normal instrument cable into the footswitch jack on the back of your unit, you should be able to create the necessary connection by touching the sleeve and the tip of the jack at the same time, thus sending a signal to the amp or pedal. Now we’re just going to put it in a box you can stomp on. A housing of some sort to put the switches, jack, and wires in. I used a metal glasses case that was collecting dust. Anything goes! Two SPST momentary type switches – I used two from Radio Shack. Some electrical wire (2 feet would probably be sufficient, you only need 4 short lengths). A drill and bit sizes that fit the switches and 1/4″ jack. Really, these steps can go in whatever order you like as long as you 1. solder everything together right and 2. get it inside the box. Drill holes in the box for the two switches. Match the drill bit size up to the outer edge of the threads on the switch where the mounting nut and washer are. The idea is to pick a drill bit size that will make the hole as snug a fit as possible once you attach the switch. Personally, if you plan on stepping on the switches, I would put the holes on the top of the box. Make sure to allow for enough space in between the switches to make hitting the right one with your foot fairly easy. Now drill a hole for the stereo jack. Again, match up the drill bit to the edge of the threads. I would put this hole on the back of the box. Note: If the switches you are using need to be mounted from the top (the nut and washer attach on the bottom), make sure to install them in the box before doing your soldering. Otherwise you’ll never be able to get them in. This might make for harder soldering, but it’s better than having to un-solder! 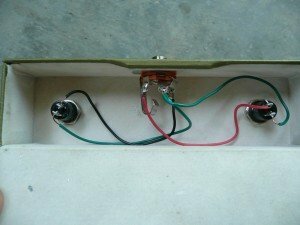 As far as wiring projects go, it’s incredibly easy. Cut yourself four pieces of wire that will be long enough to reach from the jack to the switches where ever you decide to mount them. Give yourself an extra few inches. You can always bend the extra wire out of the way. You can start the wiring a number of ways but I would solder everything to the 1/4″ jack first. Solder two wires to the “sleeve” tab on the input jack (the sleeve tab should be the top layer in the “jack sandwich”. It’s the one that goes through the center of the jack). This is the ground. Then solder one wire to the “ring” tab and one wire to the “tip” tab. These are the two remaining tabs that make up the bottom of the “jack sandwich”. Now solder one ground (sleeve) wire to one side of each of the switches. The tip wire can then be soldered to either remaining switch terminal. So can the ring. Which order you choose only decides what switch will activate the pedal/amp’s “ring parameter” and which on will control the “tip parameter”. If it doesn’t matter to you, just flip a coin and solder. From here, the only thing left to do is mount the assembly in the box. If your switches are already installed – great! If not, put them in and tighten down the nuts (the washer goes on the nut side). Same with the jack. Close up your box. To use both switches, you need what is called a “TRS” cable. This is the stereo cable that sends two signals instead of one. If you use just a normal instrument cable, only one of the switches will have a function.